RAD has announced that it will be expanding the timing synchronization capabilities of its Service Assured Access (SAA) solutions when it introduces the world’s first SFP-based IEEE 1588 Grandmaster with a built-in GNSS receiver at Mobile World Congress 2015. Many network operators prefer to use IEEE 1588-2008 (also known as Precision Time Protocol, or PTP) and Synchronous Ethernet to deliver accurate frequency and time throughout 4G backhaul networks. They are reluctant to install GNSS at every cell site due to practical and cost reasons, as well as the growing concern about possible GNSS jamming and spoofing. However, accurate time distribution requires every network element between the time reference – the Grandmaster – and the cell site to support IEEE 1588. This could be an expensive and complex endeavor when the Grandmaster is located in a central PoP. 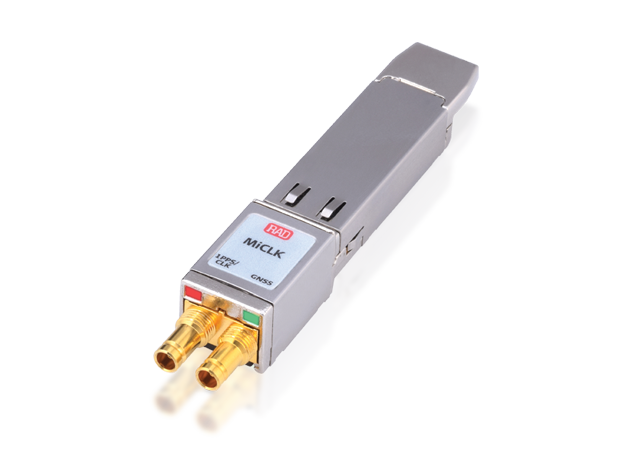 “MiCLK allows network operators to avoid costly upgrades by bringing the Grandmaster to the base station,” says Broida. RAD’s innovative, patent-pending MiCLK is a miniature pluggable device that responds perfectly to the needs of next generation cellular backhaul networks. Its SFP design allows simple installation that effortlessly upgrades any network device with a fully featured IEEE 1588 Grandmaster, including a GNSS receiver and various redundancy options to sustain its operation in case of GNSS failure. In addition to MiCLK, RAD will also be demonstrating at Mobile World Congress 2015 its SAA performance monitoring and vCPE implantation options. From March 17-20, MiCLK will be demonstrated at the Multi-Vendor Interoperability showcase organized by the European Advanced Networking Test Center, EANTC. The showcase at the co-located MPLS SDN World Congress and NFV & SDN Summit in Paris.